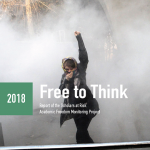 SAR’s Academic Freedom Monitoring Project focuses on developing a greater understanding of the volume and nature of attacks on higher education communities in order to develop more effective protection responses. Incident reports are produced by a network of higher education and human rights professionals—including faculty-led graduate student clinics at SAR member institutions—serving as volunteer monitors for specific countries or regions. Researchers identify incidents of attacks on higher education systems, institutions or personnel and record the details of each incident, analyzing each incident and attaching corroborating primary and secondary source material when possible. SAR processes, verifies and consolidates reports of incidents for distribution and the mobilization of advocacy responses. SAR invites academics and researchers interested in joining the monitoring project as volunteer researchers or coordinating an academic freedom clinic for law students to contact us at sarmonitoring@nyu.edu. Guided by faculty, students research and advocate for imprisoned scholars and the right to be #free2think.